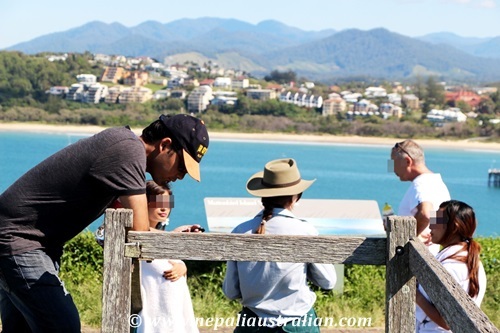 From Forster, we went to our next stop, Coffs Harbour. 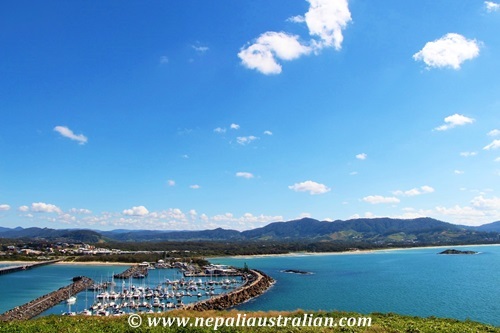 Coffs Harbour is a coastal city located on the north coast of New South Wales about 540 km (340 mi) north of Sydney, and 390 km (240 mi) south of Brisbane. 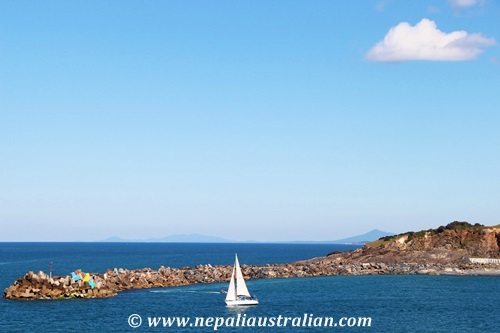 It is a popular sea change destination attracting people to relocate from big cities to smaller towns on the coast. 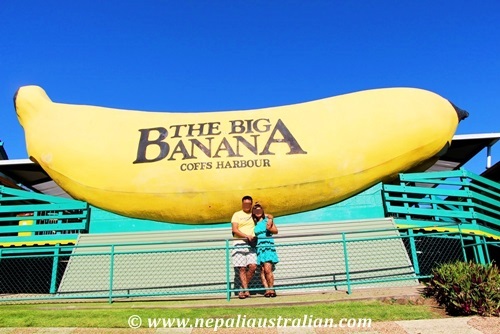 As we had only one day there, we had our breakfast and went straight to one of the most iconic places in Coffs harbour, the Big Banana, one of the first of Australia’s Big Things (it celebrated its 40th birthday in 2005), with the World’s Largest Banana celebrating the region’s best known export. 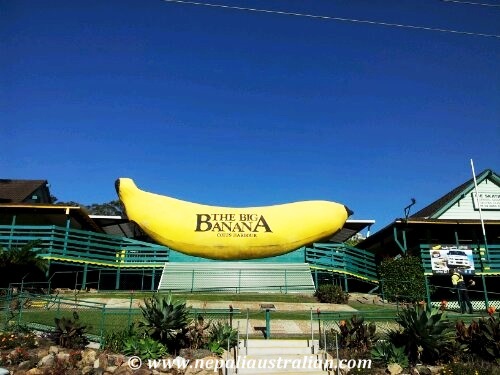 Coffs Harbour is the hub for a thriving banana industry. The big banana was not as big as I expected but we took some photos in front of it and went to the next stop, camel riding along the beach. 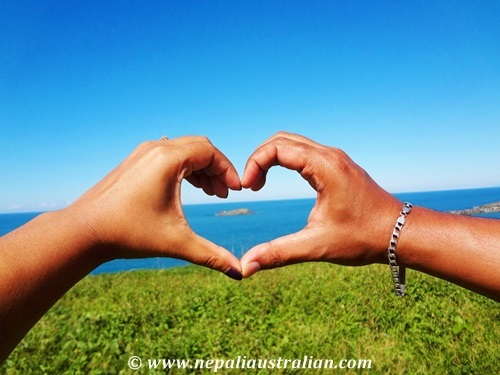 Unluckily the ride was at least an hour away so we decided to ditch the plan and went on a hike instead to the beautiful Muttonbird Island. Muttonbird Island is a great spot for watching birds up close; it’s one of the only easily-accessible places in NSW where the migratory wedge-tailed shearwater nests. 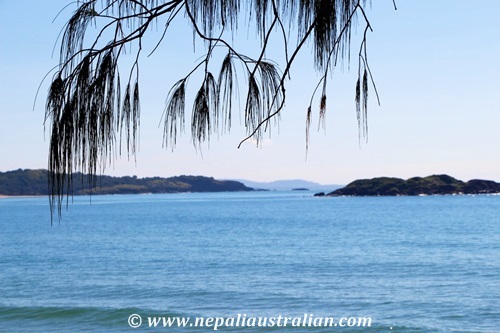 It is also an important Aboriginal place, harbouring stories of the Dreaming and a wealth of traditional resources. The island, which is effectively one big hill, is connected to the land via a breakwall alongside the International Marina. 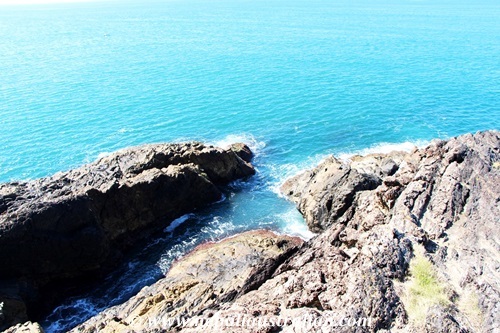 As we started our walk I could see that the trail seemed too long but as we ascend, I loved the place. All I could see was the green island and blue water. The sun was shining and the day was perfect to spend on the beach. 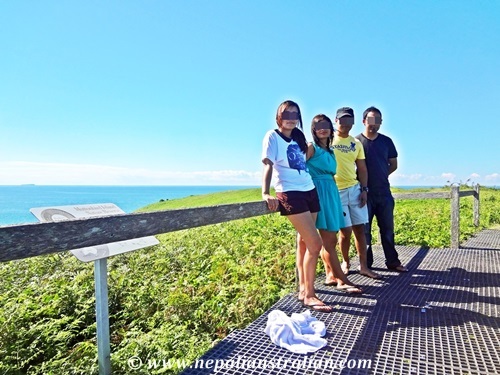 A 500m paved walkway runs across the island to the other side. The path was well maintained so it was an easy hike and we saw many people around the island. Finally when we reached the top of the island, we were greeted by a council worker who was there to explain to us about the island and the birds there. 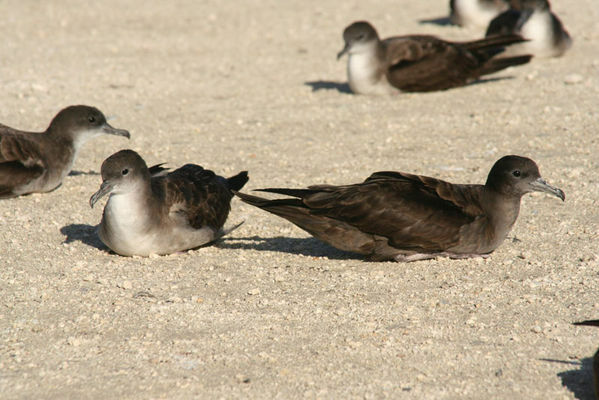 Home to thousands of wedge-tailed shearwaters, also known as muttonbirds, the island is a protected Nature Reserve. Shearwaters are named for their ability to cut or shear the water with their wings as they skim across the surface. Early settlers called them muttonbirds for their fatty mutton-like flesh. 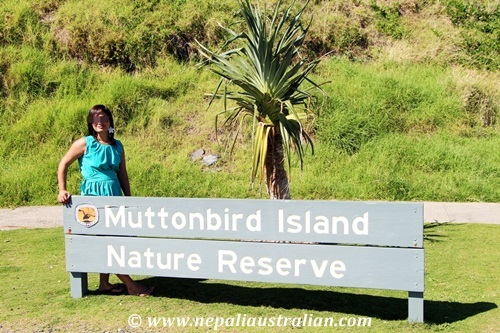 The muttonbirds spends the Australian winter in South-East Asia and travels thousands of kilometres each year to return to the same burrow on Muttonbird Island in August. The island’s plant cover hides the thousands of burrows and people are urged to stay on the track so as not to damage any of the burrows. A pair of birds takes turns incubating a single egg and also sharing in the raising of their chick. They forage for food during the day and return to the burrow just after dusk. The muttonbirds leave the island for their annual migration in late April. 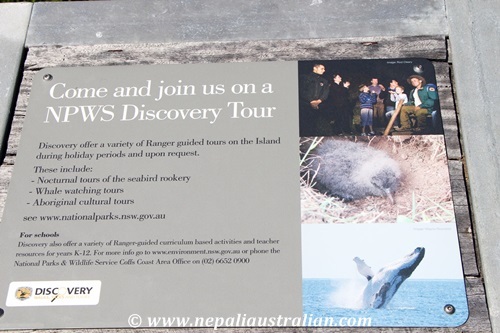 There are interpretive signs at the start of the walkway at the bottom of the island and along the path, explaining the lifecycle and habits of the wedge-tailed shearwaters. The lady was really nice and it was an educational trip. 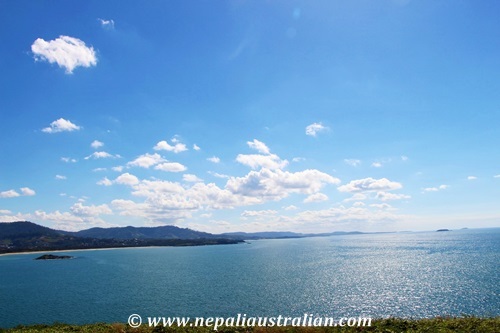 From top of the island, we could see an incredible 360-degree view across the ocean, beaches, harbour and marina, the city and the mountains. At the end of the walkway is a viewing platform, providing uninterrupted views of the waves crashing onto the rocks and of the Solitary Island Marina Park, which starts here. On the platform, there were interpretive signs about humpback whales. 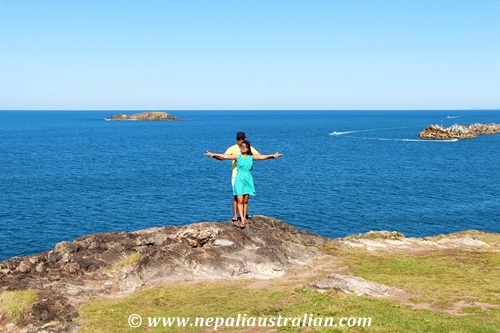 Muttonbird Island is one of the best spots on Coffs Coast for whale watching but unfortunately we didn’t see any that day. After an hour or so on the top, we decided to descend. 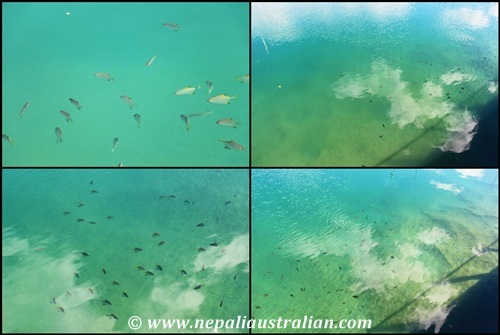 As we were walking back to the car park, in the harbour, we saw a lot of of fishes which can be view from the top of the breakwater as the water is so clear. Finally we hopped into the car and went for lunch which was to McDonalds that day. 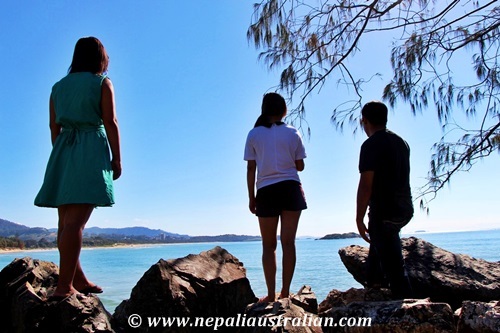 Then we just explored the other parts of the Coffs Harbour until it was time for us to move to our next stop, Port Stephens. 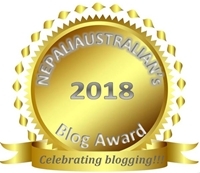 This entry was posted in Australia, NSW - Australia and tagged Coffs Coast, Coffs Harbour, Forster, long weekend, Muttonbird Island. Bookmark the permalink.